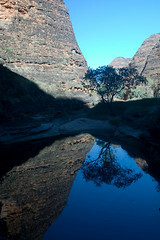 On my swing through Western Australia, I made a stop at Purnululu National Park, home of the Bungle Bungle mountains. When I told people I was making the drive from Darwin to Perth, everyone told me I had to stop at the Bungle Bungles. I wasn’t really prepared for how remote and hard to get to it would be. 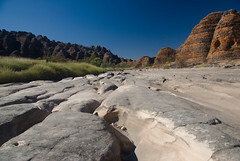 To get to Purnululu, you have to drive about three hours south of Kununurra, which is itself a day drive from Darwin. (800km/500miles) There are no real cities or towns anywhere near Purnululu. The closest thing to a settlement is the Turkey Creek roadhouse, which is nothing more than a gas station and a campsite. There is an abrigonial community near the roadhouse, but it is closed to the public. Once you get to Turkey Creek, you are still several hours from entering the park. The day tour I took picked me up at around sunrise at 5:30am. We had a 4WD bus, similar to the sort I took on Fraser Island. Just going from the Turkey Creek roadhouse to the entrance to the park was a three hour drive, none of which was paved. From the park entrance to anything interesting in the park was another hour drive from the park gate. The Bungle Bungles weren’t really “discovered” until the 1980’s. I put “discover” in quotes because it was known to the local aboriginals and to local ranchers, but they never thought it was a big enough deal to tell anyone about. In 80’s a television crew in a helicopter brought footage of the bee hive domes back. 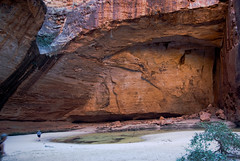 The main reason why Purnululu is special is the erosional features. 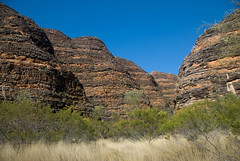 The Bungles aren’t a large mountain range. I’m not even sure you can call it a mountain range at all, but that is the term which is used. 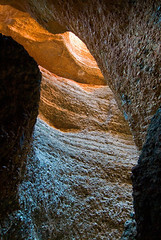 On the north side of the range, you can find Echnida Chasm. The chasm is just a split in the rock where it was cleaved apart. You can walk down the middle of the gap which rises up almost 100ft (30m). At some points, you have to turn sideways to get through because it becomes so narrow. After four hours of driving, Echnida Chasm was the first part of the park we visited. After that, we packed up again and drove to the south side of the park to have lunch. It took about an hour and a half to get to the permanent camp which the tour service has in the park. We had lunch there and then went to the south part of the rang, where we were able to walk around the signature feature of the park: the Bee Hive Domes. The bee hive domes are called that because a) they are domes and b) they are striped like a bee hive. Both of those features are fairly unique. The domes were created by erosion channels which flowed at 90 degree angles to each other. You usually only see erosion channels which are close to perpendicular to the face of a mountain, but here you see it on more than one axis. Despite how dry it was when I was there, Purnululu can experience so much rain during the wet season that they close the park. I assumed the striping on the domes was due to different layers of sediment, but I was wrong. The bands are due to layers of microrganisms which gives the bands color. Underneath the bands, the rock is an almost white sandstone. There were a few places where the colored crust was broken off and you could see the sandstone underneath. Also on the south side is Piccananny Creek, which is the main water channel during the wet season. It was dry when I was there, but you can see large erosional channels carved into the rock in the bed of the creek. You could also see what looked like post holes in the rock. This happens when a smaller rock gets trapped in a depression and the water swirls the rock around, scouring out a round hole. The biggest feature in this area is Cathedral Gorge. It is an enormous water carved channel created by the creek. You can look at the walls of the gorge and see just how high the water gets during the wet season. (about 12ft/4m) The walls of the gorge are enormous and really give you the feeling of being small when you are inside. 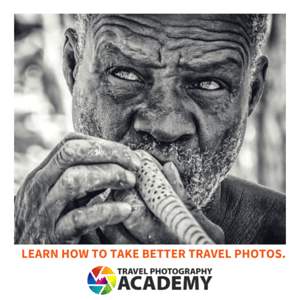 From what I’ve seen, Purnululu is probably the premier attraction in Western Australia, however, it is so remote and hard to get to, it isn’t something I’d go out of my to see for its own sake. If you are making the trip from Darwin to Perth, however, you definitely need to stop as it will be the most incredible thing you’ll see along the way. very nice national park but you can only get there by 4×4 that what make it very good because most of the people are not able to get there! I'm sure it's even more gorgeous in person! I have read about the bee hive rocks. Very cool formations. @Elizabeth: I have no choice in when most tours start. In this case, you have 8 hours of driving just to get to and from the park. That doesn’t include time spent actually seeing stuff. There was lots of driving requires in Uluru as well. @Maryam: they aren’t real bee hives. They only look that way. Those bee hive domes sound amazing. The wild honey here in Marrakech is incredible and many Moroccans use honey for all kinds of medicinal purposes. Why is it that your tours all start at ungodly hours? Are you a morning person?